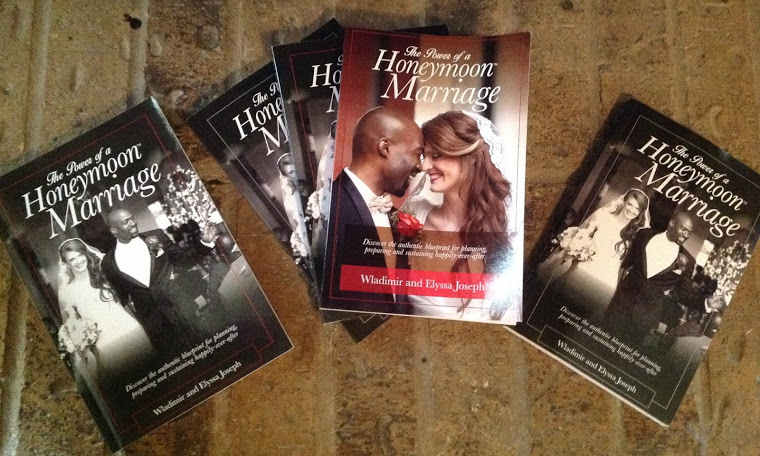 It's Never Too Late To Live Happily Ever After (Whether Single or Married). Wow...the Lima Peru Crusade with Prophet TB Joshua was amazing! We were joined at the crusade on Friday, Sept 23rd with about 40,000 people and on Saturday with about 60,000 (these are our amateur crowd attendance estimation). Words cannot capture the equal measure of desperation, faith, hope and love that was on profound display. (Bride Elyssa's favorite) A 7-year old girl walks for the first time because she was born with twisted knee caps. 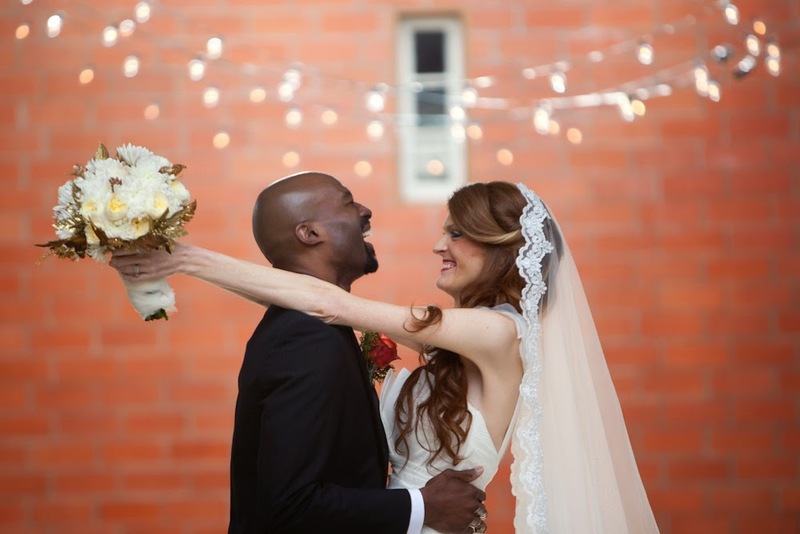 This is special to my bride because my bride similarly had a supernatural leg healing around 5-years old and this created an imprint in her to believe in God's existence no matter what difficulties she encountered in her life. 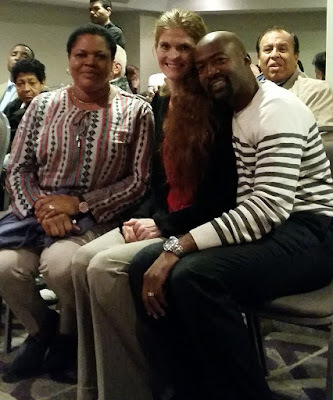 (Groom Wladimir's favorite) We were invited to personally meet with Prophet TB Joshua. During the personal meeting with Prophet TB Joshua, he listened to our marital ministry vision "Eradicate Christian Divorcing," and then he affirmed and supported us by laying his hands on each of us--to fulfill my request--to receive deliverance, healing, and impartation. Then he extended to us a special invite to visit the Synagogue Church Of All Nations for additional prayer and ministry intercession time on behalf of our marriage and relationship ministry. He additionally gave some of his best resources for free. Wow...what an amazing man of God and prophet! 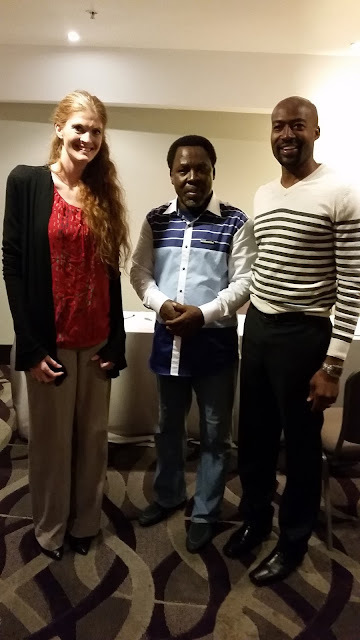 The picture is immediately taken after the private one-on-one pastoral meeting of Prophet TB Joshua to my bride and I which Prophet TB Joshua similarly did with many other ministry leaders. Wow. Praise God for the great commission that still continues. Beloved Mrs. Evelyn Joshua (married for 26 years) greets us warmly! If you missed viewing the crusade, all is not lost. There is a reshowing of the Lima Peru Crusade event at http://emmanuel.tv, this weekend. Friday 30th, (EST) 10:30 am, (CAT) 4:30 pm; and on Saturday 1st, (EST) 8:00 am, (CAT) 2:00 pm. God is awesome for all His providence in that crusade, in addition to the personal pastoral consultation from Prophet TB Joshua. We can, and we will get to the next step God has ordained, because of God's supernatural power we encountered during the visit to Lima Peru, Prophet TB Joshua and the SCOAN staff. Thank you Prophet TB Joshua and the SCOAN staff. Wladimir+Elyssa Joseph Are Going to Lima Peru and Who Is Prophet TB Joshua? When you read this, here’s why I wrote it. I mainly wanted to share the info about Prophet TB Joshua ministry because what’s happening there is very paralleled to the Book of Acts and the New Testament. I am a partaker in this ministry from a distant nevertheless have been profoundly and positively influenced through this ministry. Now, flights have been booked for my bride, and I and we will witness the New Testament and the Books Of Acts in action, during the Lima Peru Crusades. We will not return back the same way we leave. and snapshot from previous Crusades. What is my excitement about? I've been in the church since 1994, and in seminary but, I haven't had more hope in God than I now have because of the many wonderful future possibilities to the kingdom of God on earth when I witness what is going on in the SCOAN (Synagogue Church Of All Nations, overseer by TB Joshua) ministry in Lagos Nigeria. It is reverberating a focus on the supreme power of God throughout the world, and that has helped countless get loosed from the grips of the supernatural darkness manifested through hexes, jinks, curses, and manifold deception. The supernatural power of God in the fluent demonstration at SCOAN shows me that the supernatural darkness (that's causing Christian marital problems, and other ills in the Christian body) CANNOT overcome the supreme power of God being manifested in plain sight on earth, and especially in the life of we believers who deeply surrender to Jesus’ fullness, Faith in Jesus and Scriptures. Here is my personal brief synopsis of Prophet Tb Joshua and his ministry. Can the book of Acts be in operation practically in every church service that takes place at the SCOAN? Well, it really seems that way to me. I haven’t seen differently. Below is a list of links for your own perusal. In their church service, the ministry demonstrates a vibrant five-folds ministry of prophecy, preaching, healing, deliverance, and the ministries global reach speaks well also to the supernatural gift of administration in this ministry. The way the SCOAN ministry has grounded my household to pursuing God's power, protection, and love has been unparalleled. 19 For the Son of God, Jesus Christ, who was preached among you by us, by me, Silvanus, and Timothy, was not “Yes” and “No,” but has proved to be “Yes” in Him [true and faithful, the divine “Yes” affirming God’s promises]. 20 For as many as are the promises of God, in Christ they are [all answered] “Yes.” So through Him we say our “Amen” to the glory of God. As you watched a few videos, you see in the videos at the prayer lines or during the live service, all kinds of sickness (without exception) being healed and all manner of hardships (marital, financial, generational, health, physical, etc) being manhandled by the supreme supernatural power of Jesus Christ as administered by Prophet TB Joshua or the ministry staff SCOAN, (and now anyone with anointed water prayed for by Prophet TB Joshua), then the above 2 Cor. 1:20 passage is not poetical or theoretical but actual and practical right now. God is all-powerful now and in the future at the end of time. In conclusion. We love you and hope the best for you, hence we are sharing our good news with you. I believe my bride and I will not be the same after going to Lima Peru and partake with Prophet TB Joshua at this crusade. The Lord of Heaven and Earth will show off healing, deliverance, impartation and infinitely more in myself and household. I share the details of this ministry to bring awareness of a greater working of God that is happening around the world and has the potential to be coming in a fresh way in your own home and your destiny. 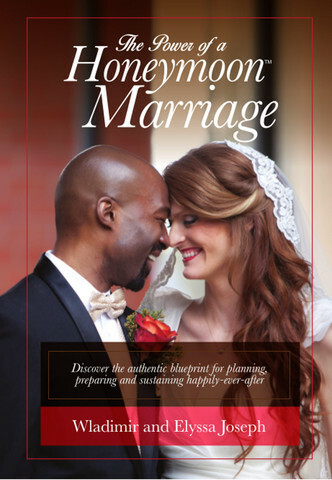 Get your FREE chapter of The Power Of A HONEYMOON™ Marriage, and sign up to receive empowering e-news.